Back in 2005 I was living in Louisville, Kentucky with my parents, still in undergrad, still had no idea what I was doing with my life, and was working part time for Radio Disney. There are a few reasons I bring this up. First I cannot tell you how frustrating it is when you get a job interview and the only reason you did was because the interviewer was only interested in knowing about your Disney experience. "Are there really tunnels under the park? ", "You must have wonderful customer service skills, Disney is the best at that. ", and my all time personal favorite "I want to be a snowbird and work for Disney when I'm down there, do you know how I can do that?" Disney has always been a bit of a blessing and a curse. Moving on though, at Radio Disney I met some pretty amazing people! Many I still remain in touch with to this day, and even though we don't see each other all that often, some of us know that if the other needed us, we would drop everything and be there for them in a heartbeat. Just Julie, Lively Lizbeth, Jay Rock, Kit Thunder, Wandaful, Chaos, Jazzy Ali, Puddin' Cup, and many others will be names that I will forever remember. Sometimes our Disney names are the only names I remember, lol. Whether or not these people know it all of them left a mark on me. I worked with Radio Disney for five years, and even though a lot of other aspects of my life were a wreck at that time, Disney was a passion and helped me find my way. Some people leave more of a mark on your life than others do though. This doesn't mean that anyone was less important than another, it just means that they have a different purpose for being in your life. Ali Omar, or Jazzy Ali, will forever be one of those people to me. I met him back in 2005. I'd been working for Disney for two years by then and was a "seasoned pro" by that time. I knew how a typical show went, I knew what needed done at an event, and occasionally I would be asked to show new team members the ropes. Ali had been hired to be a talent, he was the face of an event being on the microphone and leading the games. I was more like support staff making sure the talent had the props and prizes they needed when they needed it. Ali's first event was a rather simple one hour event at a festival. I was there with two other employees, another talent who was also training Ali, and another team member to run the sound system. Ali wasn't nervous about getting on a microphone in front of the crowd, he was excited and ready to go...and he was a natural. Over time Ali and I became friends. Although we never really hung out, we often talked on the phone, and occasionally made plans that we never followed through on. Had I known then what I know now, maybe we would have tried harder to get together outside of work. We had planned on going to a renaissance festival together at one point, because he was African American he laughed at the idea and said straight faced to me "they wont know what to do with a real black knight". This provided quite a bit of laughter. After a discussion at an event on a Sunday afternoon we were cleaning up and I mentioned that I needed to hurry up and get out of there I had to attend church that night. We briefly spoke about religion and that led to how long services were, "people get upset if the services are more than an hour." I commented, he gave me a stunned look then looked at his watch. "I think they're still in church back home, services began at 11am." It was almost 3pm. We decided that we needed to worship together at each others churches sometime, but again plans were made but never followed through on. It was a shock one year at Halloween, our busiest time of year, to get a call from my boss asking if I could cover one event since she had to go to another and talent. Ali was in the hospital. No one knew that he had been fighting cancer for quite some time. I had a difficult time digesting that a good friend was so sick, how fair was it that this man in his twenties was fighting for his life when he brought so much joy to those around him and was doing so much good in the world. A little while later my boss organized a hospital visit, we dressed in costume and went to cheer him up. Needless to say we cheered up quite a few people on that visit, but Ali seemed so happy to see us! Ali recovered from that trip, got to go home, and even began working again. For Christmas that year I made him a crocheted afghan. A prayer blanket. With prayer blankets you say a prayer with every stitch that is made, putting your love and care into the gift you are giving. I got a card from Ali shortly after I sent him the blanket, in the note he said that he would be paying forward the blessings that I had sent him, and telling me how much of a good friend I was. To be honest, even though there were still times when Ali went back into the hospital for a short time, it never stopped him for long. He wouldn't let you talk about him being sick, and somehow would always turn the conversation back to you. 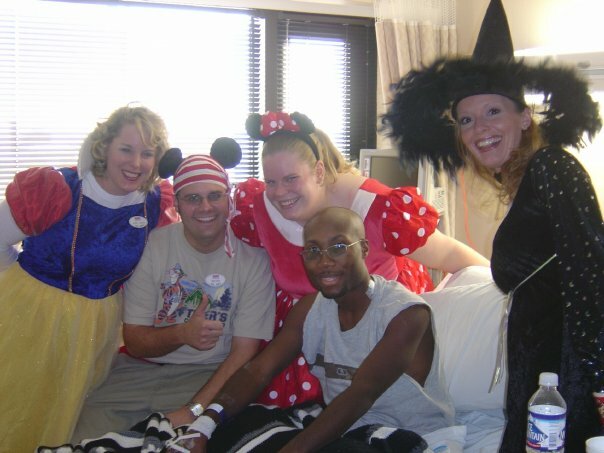 That summer I decided to do a March of Dimes walk so I sent an email out to all of my Disney coworkers asking them if they could support me. Ali sent me a card with a $10 bill in it. In large writing on the inside of the card Ali wrote, "You are da Bomb! Keep up the good work you do for other people. LIZA FOR PRESIDENT!" Even through his own difficulties he wanted to help, that's just who he was. The next Halloween Ali was healthy and working Radio Disney events again! He and I were scheduled to work a small event together and since it was Halloween we were allowed to wear costumes rather than our normal uniforms. 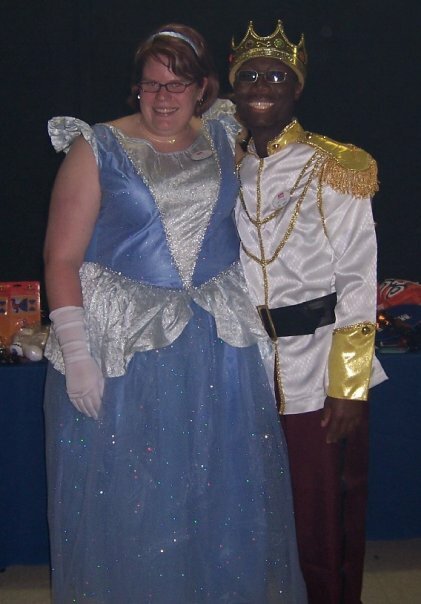 Ali said he planned to be Prince Charming, and I just so happened to have a Cinderella costume that year. We were the only two working the event with our boss on the sound system, so it was great fun that we coordinated. As a matter of fact while we were setting up a little girl came up to me in awe that she was seeing Cinderella. Her mom took pictures of us together, and the girl practically attached herself to me. After her mom got her to go with her I walked back to my boss and Ali and said that was amazing, "The only time I'll ever be mistaken for a princess." Ali looked at me and very honestly said, "Liza you are as beautiful as any princess, don't ever think you're not." We had so much fun with that event, Ali even at one point got down on one knee and proposed, lol. From that point on it was only natural that we called each other Prince Charming and Princess. Things happen though, Ali worked fewer and fewer events, and I left the company to pursue another job and finish college. We also spoke less and less. In February 2009 though I received a text message while walking through Target, Ali had passed away. I admit it, I broke down into sobs in the middle of Target. I quickly checked out and got out of the store to my car where I called my former boss and a few other co-workers to see if they had heard. I then went home, literally ran to my mom, and cried for some time. A while ago when I was unpacking my things here in Denver I unpacked a box full of my photographs and artwork. I have both photos I've posted here framed in my house. When I unpacked them I began sobbing again. Even though Ali was not my first experience with death, he was the first friend I've ever lost. Thinking about his death makes me more emotional than family members who have passed. Maybe it's the fact that the family I've lost were older and at their ages I felt that they had lived full lives. Ali was 28, he was my peer, and somehow even though he did more in his life than many people three times his age, it still feels unfair that he was taken away so young. Maybe it's also a reminder to me that it doesn't matter how old we are, life is always too short so you have to make what time you do have count, Ali did. I've been really upset lately with the fact that I haven't been able to find work, and I still feel like I don't know why I'm here. Being reminded of Ali though has reminded me that there is a reason I'm here even if I haven't found it yet, just like there was a reason he was in my life. Unpacking those pictures prompted me to dig out the two letters mentioned here as well. Ali reminded me that I am doing the right things, I think he would have been so excited for me to have moved out here. Ali was always positive, always "paying it forward", and always supportive. Somewhere along the way I forgot that those are the important things. I am blessed and rather than being angry all the time about the things I can't control I need to be positive about the things that I can.